In this week’s Pet Talk, Maneka gives tips on treatment and prevention of diarrhoea in horses and explains what has to be done if horse has ringworm? Can I get some tips on treatment and prevention of diarrhoea in horses? Make sure your horse is eating and drinking normally. If, after 24 hours, the diarrhoea is not gone, it is time to call the vet. If the diarrhoea isn’t caused by something obvious that you know will pass, then it’s time to discover other possible causes. Start to worry if along with diarrhoea, your horse also shows any of the following symptoms: • Extremely watery manure; • Blood or mucus in the manure; • Foul smelling manure (beyond the normal manure smell); • Diarrhoea lasts more than twenty-four hours; • “Projectile pooping”; • Other colic symptoms; • A change in TPRs that suggest the horse has a fever; • Lethargy – low energy; • Signs of weight loss or other health problems before diarrhoea started; • There are signs of dehydration. Avoiding diarrhoea is very like avoiding colic. Avoid rapid changes in feeds. Introduce horses to lush pastures gradually. Keep feeds such as grains and concentrated locked down so horses that might get loose can’t help themselves. De-worm your horse regularly. Vaccinate your horse with the core vaccines and any that are appropriate for your area. What to do if your horse has ringworm? The horse should be treated with anti-fungal wash. Some vets may suggest shaving the area. Because the fungus will persist on the horse’s brushes, tack and stable, all must be washed down with an anti-fungal solution to prevent further spread. The antibiotic Griseofulvin works well. The method of treatment is to include the antibiotic in the feed everyday for one week. It prevents the fungus from growing. Another antibiotic called Natamycin is active against ringworm and is used as a wash at the site of infection. It is important to cover the whole body to reach lesions that are not yet apparent. The treatment must be repeated every fourth day, at least three times. Keeping your horse in good health is the key to avoiding many problems. It is a good idea for each horse to have its own tack and brushes. If ringworm is suspected, the horse should be kept away from others until the lesions disappear. Why do horses chew wood and how to solve the problem? Boredom or Frustration: Horses kept in stalls, small paddocks, secluded from other horses, or fed largely concentrates, without enough fodder to keep them chewing over a long time, may become bored and chew fences for something to do. Nutritional Deficiencies: Very occasionally vitamin deficiencies may cause a horse to have pica — a taste for eating strange foodstuffs in an effort to alleviate the deficiency. Habit: Some horses may have learnt to gnaw wood from stable or pasture mates. If you suspect pica, you need to have your veterinarian draw a blood sample and find out exactly what nutrients your horse may be missing. This way, you can supplement with the exact vitamin or mineral in the correct amounts. When we keep them cooped up, restrict their diets, keep them from being with other horses, or don’t provide them with enough room to self-exercise, our horses may find other ways to vent their frustration and show their boredom. Allowing horses to live as naturally with other horses, outdoors with plenty of grass or hay to nibble on, can prevent wood chewing. Can a horse get all of its nutrition by just eating grass? On the best quality pasture, horses should be able to get all the nutrients they need. This, after all, is what they evolved to eat. Unfortunately, very few owners, though no fault of their own, have top quality pasture. Over-grazing, drought, freezing, poor management, poor soil, snow cover, all affect the quality of the grass and the horse’s ability to extract adequate nutrition. Most horses will require supplementation with minerals, fodder, or concentrates, for at least part of the year. Why does my horse drool so much? Grass sickness is known to cause excessive salivation, alongside colic symptoms, lack of appetite and even a foul-smelling discharge from the nose. The disease causes damage to the nervous system, and so, most symptoms are related to neurological functions — including paralysis of the digestive tract and gut. Although highly uncommon, rabies can also cause excess salivation, but is fully preventable through vaccination. Another possible cause of excess salivation is when your horse has eaten something which is causing the drooling. One of the more common reasons for this is known as slobbers, and is often caused by clover. 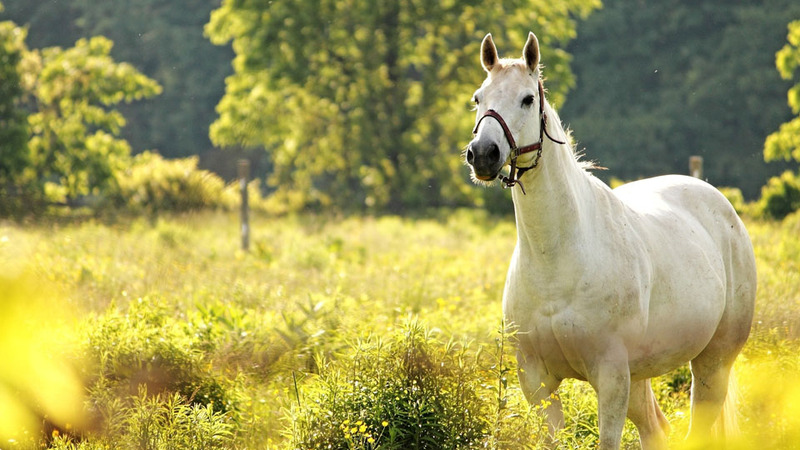 This condition isn’t life threatening and doesn’t need specific treatment per se, but it is, of course, important to remove the clover to stop the symptoms — your horse should return to normal fairly quickly after this. If there is a discharge from the nose, this usually indicates that there is a blockage somewhere. In this case, you should consider that your horse has “choke.” This is when food gets stuck in the oesophagus and cannot pass to the stomach, so the horse “chokes.” In this case you may also be able to see bits of food in the saliva and nasal discharge, and the horse will seem distressed. He may also bend and stretch his neck in an effort to dislodge the food. Remove any food and water from your horse, call your vet and try to keep the horse’s head low, and him calm – usually, choke resolves by itself, but it may need treatment.